Liliane Lijn’s friendships with writers in Paris and New York first led her in the 1960s to experiment with the written word and to collaborate with poets in her first Poem Machines and Poem Cones. These kinetic works make words revolve at speed: Lijn states that ‘the word accelerated loses its identity and becomes a pattern pregnant with… the energy of its potential meaning should it once again become a word.’ In her book Crossing Map the drawings interweave with the text, and Lijn ‘uses language as a mirror for our culture, avoiding the use of nouns and punctuation, and inventing a new prose structure’. 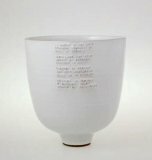 Rupert Spira combines ceramic vessels with poetic texts – the words explore the nature of consciousness: this exploration is a subtle and elusive undertaking and the effort to read the words should reflect this. To begin with perhaps just a few words will be clear… like finding the corners of a vast jigsaw puzzle. At each look a few more phrases will appear and the character of the poem will begin to emerge. However the content of the poem, like its subject matter, will always remain difficult to grasp. The process of exploring it should be fascinating but frustrating, drawing the viewer into the bowl on one level and into the meaning of the words on another. 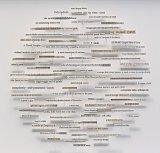 Georgia Russell cuts and transforms ephemera: books, music scores, newspapers, maps and photographs. She sees books as sculptural objects with an inherent history, representing ‘the hands which have held them and the minds they have passed through’. She uses a scalpel to dissect and flay the pages of her chosen books, her intention being to give them ‘a new life and new meaning’. 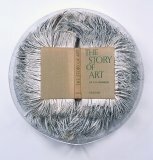 The resulting works hover between object and image, and she somehow manages to retain and reclaim the past life of an object as much as her techniques attack it.